The work and life of the modern British artist Edward Bawden (1903-1989) is being celebrated at the Dulwich Picture Gallery with a major retrospective exhibition. This excellent exhibition has been curated by James Russell. 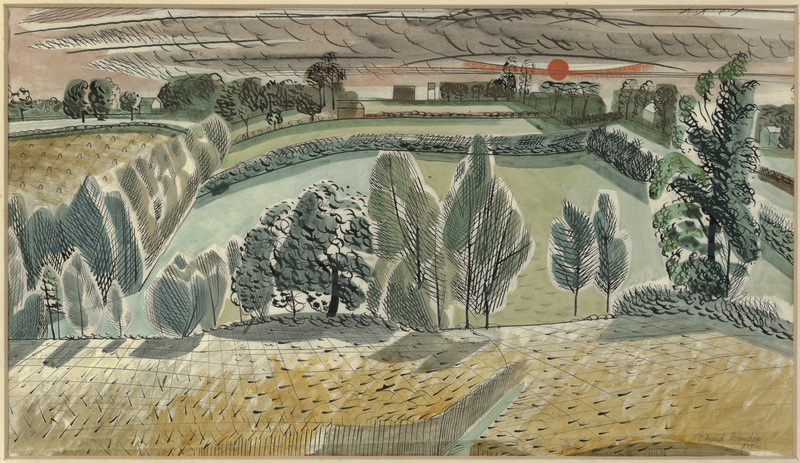 It is chronologically hung which gifts the show with a strong narrative allowing you to see Edward Bawden’s development as an artist and the techniques and themes which unite his work. Edward Bawden has links with Sussex and not least through his lifelong friendship with Eric Ravilious who he met whilst studying at the Royal College of Art in London. Both men studied under the artist Paul Nash, who was generous in encouraging and promoting their work. Edward Bawden is perhaps most famous for his graphic work and illustrations. I am particularly fond of his bold, colourful linocut prints like ‘Brighton Pier’ from 1958. The composition brings together Brighton’s famous Royal Pavilion, Palace Pier and the Regency Town House. Bawden’s subtle depiction of the shadow and texture on the waves and the light cast by the lamps contrasts with his typically bold graphic style employed in the representation of the Pier’s complex ironwork. Bawden lived in Brighton briefly in the 1950s and produced a number of works depicting the city. Edward Bawden’s observations of the British at leisure, architecture, animals, gardens, the mythical, and his love of storytelling are often observed with humour. His distinguished work as a war artist is also represented and explored. A particular treat is to see so many of Edward Bawden’s watercolours. They have not always attracted the attention they deserve. The artist’s approach to this most English of mediums reflects his modern sensibilities. The graphic, linear approach employed in ‘Untitled landscape with Sunset’ reflects a very English modernism which fuses tradition with new ways of seeing and painting. The texture, light and movement of the breeze playing across the field of corn and lines of trees beneath the burning red sun place lends a fresh and particular voice to the English Romantic tradition. The chronological quality of this superb show highlights the way in which his work in a variety of mediums informed one another and the evolution of his style. The exhibition brings together some 160 works from the diverse oeuvre of this master printmaker, illustrator, watercolourist and designer. Of these more than half are rarely seen having been borrowed from private collections and the artist’s family. ‘Edward Bawden’ runs at the Dulwich Picture Gallery until 9th September 2018 and is one of this year’s must see summer exhibitions. For more information go to www.dulwichpicturegallery.org.uk.